160 Gorgeous Acres Horses Livestock OK Wikieup AZ! 160 stunning acres!! A Whole Quarter Section, with driveway, building pad, and Water Well already in. Well is capped & needs a pump. Gorgeous Views!!! Natural Spring near the West boundary line. 160 Gorgeous Acres Horses Livestock OK Wikieup AZ! Beautiful area in the Wagon Bow Ranches to the East of Hwy 93N. Roads are good. About 7 miles on County maintained roads, the remainder on POA maintained roads. Finance your land purchase for the first time in years with a home construction loan for as little as 0% to 3.5% down! Eligible for Manufactured Homes, Single Family Residences and Modular Homes! Ask us how! Wikieup is a small community on highway 93 in Mohave County, Arizona. 160 Gorgeous Acres Horses Livestock OK Wikieup AZ! This is an area of pristine undiscovered beauty. The temperature is milder than that of Phoenix, about 124 miles to the southeast. Wikieup is nestled between the Aquarius and Hualapai Mountains in a valley lying over the Big Sandy Aquifer making wells affordable. 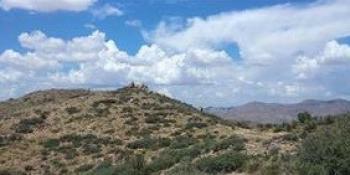 This is a great spot in Arizona to find large parcels of land, build a ranch or vacation home. Old mines and abandoned towns make great exploring.